Home → Inside Information → Score! 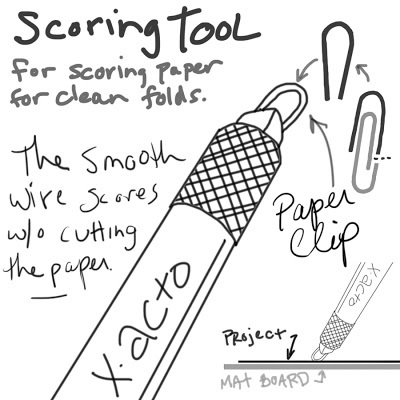 Here’s a little tool I fashioned for scoring paper/cardboard prior to folding it. It makes for a clean, precise fold. Cut off the end of a paper clip and clamp it in the business end of an X-acto handle. Use this tool to score along the fold lines of your project. Place a piece of mat board underneath the paper you’re scoring to get a deeper score.